OxiProteomics is present at the 9th edition of the “Forum of the Éco-Entreprises“, at the French Ministry for the Economy and Finance, Paris. The Forum stimulates the meetings between major actors of innovation in the field of clean & green technologies and ecology. OxiProteomics promotes cutting-edge approaches for the environmental impact bio-monitoring. 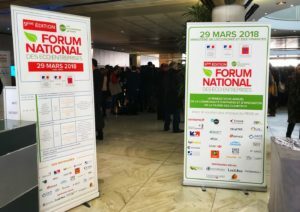 OxiProteomics participates at the “Forum des Éco-Entreprises”, Paris.